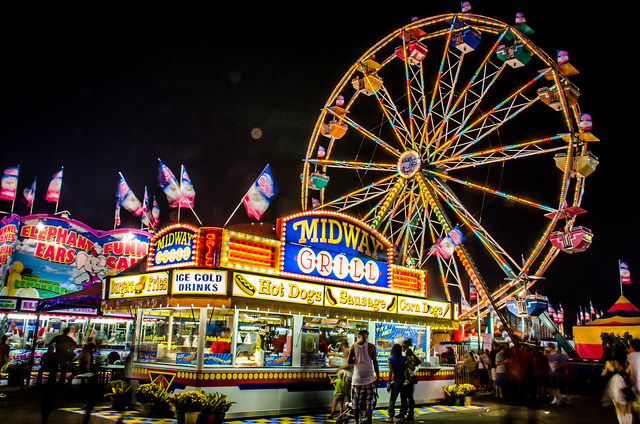 It’s that time of year again when those of us with children, or those of us who are children at heart, are starting to think about the State Fair. Some of us are thinking about fried Oreos but the youngest at heart are thinking about the rides. Watching a child at the fair is a joy for parents. Every ride is an adventure. It’s new and exciting and scary and fun, so much better than the crafts building that parents always want to walk through. The fair also makes it hard to tell which kids come from privilege and which kids don’t. A casual observer watches droves of kids run from ride to ride, begging their parents for a dollar to throw a softball into a milk jug, before heading on to the next long line. The games are equally rigged for everyone. Last year, however, I noticed a new feature at the fair. In addition to being able to purchase a “Pay One Price” ticket for your children that would allow them to ride as many rides as they could manage before it was time to go home, parents had the option of paying $15.00 extra to get an express pass. This pass would allow the bearer to access a special line. My wife and I bought two for our son and his friend. When I bought them, I almost assumed that we would be among many others who purchased the passes, and most rides would have two long lines instead of one. The reality was different. For most rides, there was no one else in the special line. For every single ride, the operator would walk first to the express pass line, and allow all those kids to board the ride first. Most of the time that was no more than four or five kids. ids would see the shorter line and run to stand in it only to be told that they didn’t have the necessary credential. This meant they had to go stand in the other line, which of course was now even longer. As the night wore on, I watched so many kids face that rejection. It wasn’t permanent, or even long lasting, but as any parent knows, watching a child’s disappointment is no fun. At one point, after watching all those disappointed kids, I started trying to make myself feel better. I assured myself that if those were my kids, they would have known that the special line required a special pass. In other words, I briefly found myself blaming their parents for my own emotions. We see this all the time when we deal with children’s issues here at SC Appleseed. Well-meaning adults, when they realize that they cannot, or decide that they will not do anything to ease the burden on a child, will blame the parents. They will create an excuse for failing to promote free school feeding programs, or support education or tax policies that help poor school districts, or demand accountability of the State’s child welfare agency, or to support programs that help the working poor get childcare. Usually the excuse is to blame the parents without looking at the full story. The parent who can’t afford quality child care for their child must not be working hard enough – although they work full-time at a minimum wage job that just will not support a family. The parents that miss school events? They have to work every hour they can get to pay for their family’s rent and groceries – and sometimes it still isn’t enough. These parents love their children as much as families with greater financial means. Giving these parents assistance now means helping their children and, just maybe, giving those kids a brighter future to look forward to, one where maybe, they don’t need any help.